I’m still painting trim in the piano room, but meanwhile, I thought I would share a past project with you. My husband and I have lived in our house for nearly 26 years. Yep. That’s a long time. Definitely enough time to have made plenty of changes throughout. After that much time, you can even get to the projects that weren’t very high on the priority list. The pantry is one such project. I have to admit, I often hide things behind closed doors. My mom says this goes way back to my childhood when I would shove my coat in the toy box or under the bed rather than putting it away properly. If I can shut a door when guests come over and hide the mess, then I don’t worry too much about it. That explains why my pantry looked like this for over 20 years. Oh, the shame! Wine, cat food and toilet paper, oh my. 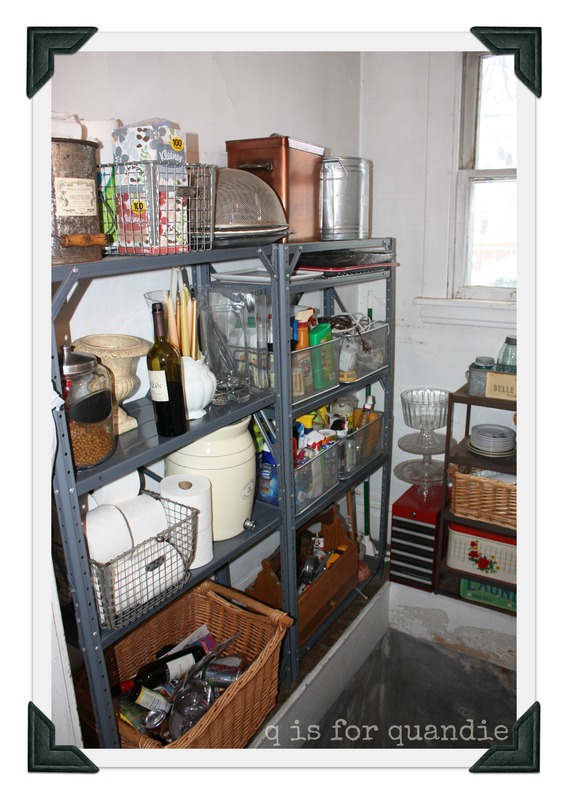 I should also clarify here that my ‘pantry’ is really just the stairway to my very creepy cellar. So, yes, that is a big opening where the floor should be. There are stairs going down there. Nonetheless, this is valuable storage space that is right off my kitchen. Not only that, the window you see faces west and gets incredible light as the sun is going down, all of which is wasted behind a closed door. My ultimate goal was to put in a door with a window, so even when the door is closed, that light would shine into the kitchen. Therefore, I needed to clean this up. No more hiding the mess. 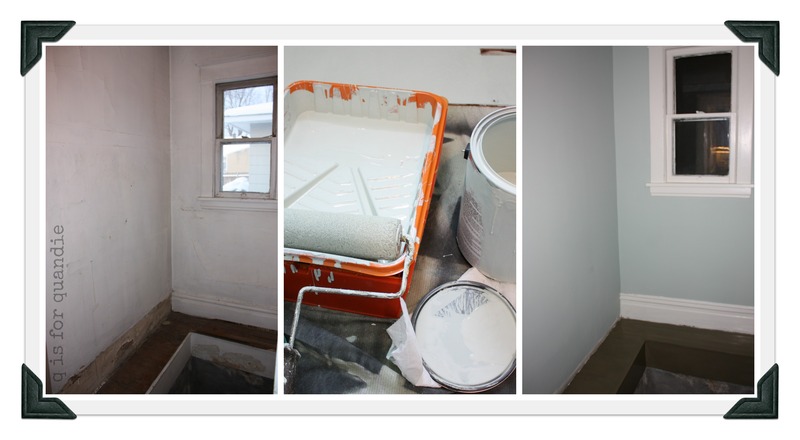 First we had some repairs made to the plaster walls and ceiling. Next came a fresh coat of paint in a lovely shade of aqua. I knew I needed proper shelves in here instead of the tacky metal garage shelves. However, I was limited by the depth of the ‘floor’. I searched high and low for pre-made shelves that would fit my space. No dice. I had to bring in the big guns. My neighbor/handy man Ken who loves to work on projects like this. He took a million measurements, I showed him pictures in magazines, and voila, he just whipped up some custom shelves for me complete with wine storage. Next came the little details inside. 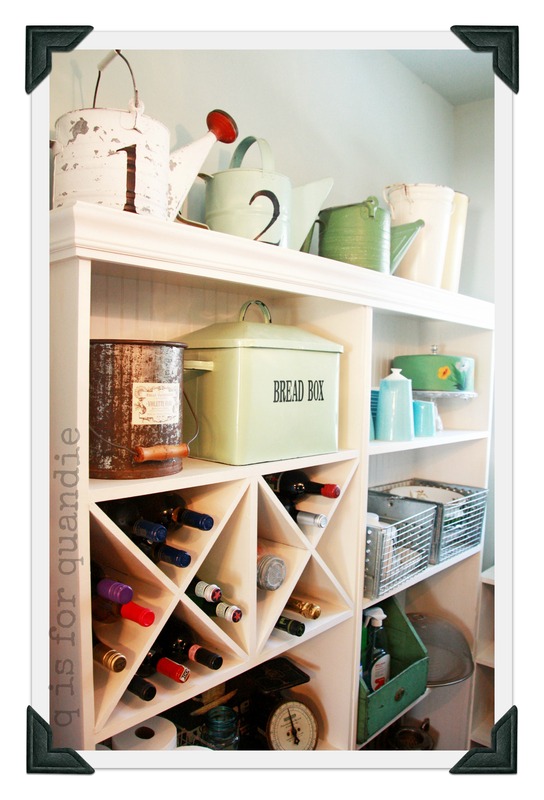 Vintage storage containers to disguise the less than pretty stuff, like Kleenex or cleaning supplies. 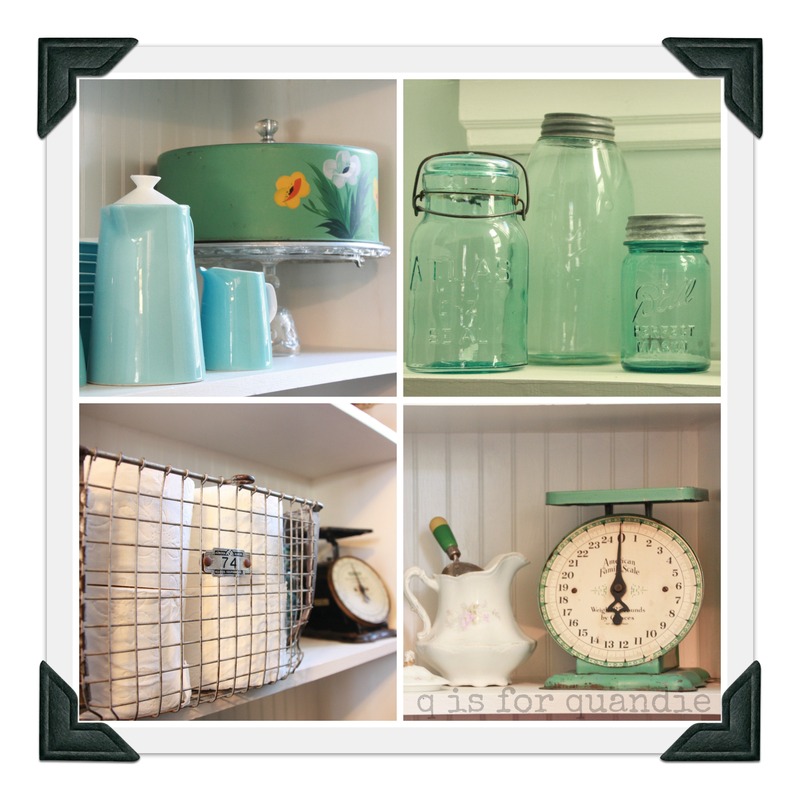 Blue canning jars, vintage cake taker, old kitchen scales and locker baskets to hold the paper goods. 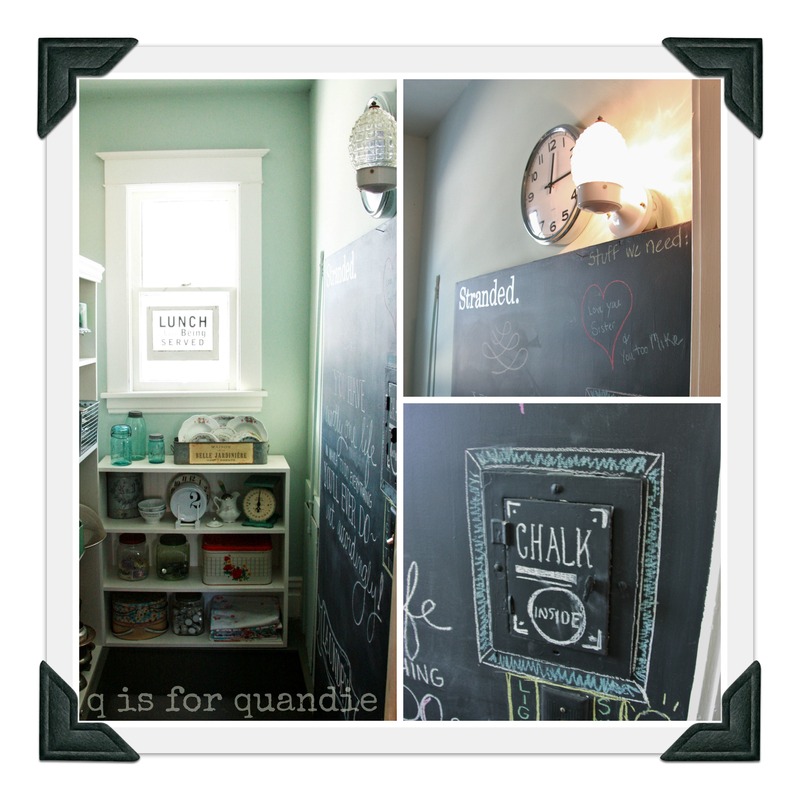 A wall of chalkboard paint on one side for fun and a new glass shade for the light fixture (from a garage sale, naturally) were added. And finally, the new door. Purchased through craigslist, outfitted with vintage hardware from Etsy, and trimmed down and hung by Ken. Isn’t it fab? And now that you can see inside, I keep it nice and tidy … most of the time. That door is fabulous. The whole makeover is terrific but that door grabbed at my heartstrings. The door really did kick off the entire project. And a little side note, the seller had two doors, so I bought the second one for my in-laws. They recently purchased a farmhouse in Wisconsin that they are fixing up. They loved it! I might have to start blogging about some of their projects as they complete them. Hey, is that the green scale I found for you @ a garage sale? Looks perfect there. I love finding things for your lovely home but should I be charging you a finder’s fee? Ha. Why yes it is! And it is the perfect shade of green for my pantry. That was an awesome find for sure. I love this. So lucky to have your handyman. I know! I thank my lucky stars for Ken all the time. He even snow blows our driveway for us in the winter! I am truly fortunate to have great neighbors! Thanks Maria! It would be treacherous if you forgot about the stairs. I confess I have had a guest or two think they can just walk straight into the pantry, but so far now one has fallen to their death or anything … knock on wood! I’m missing something. How do you get anything off a shelf with no floor to walk on, hang from the ceiling? I’m sure I am just being dense, but could you explain this to me. I mean, it is just a giant hole, right? 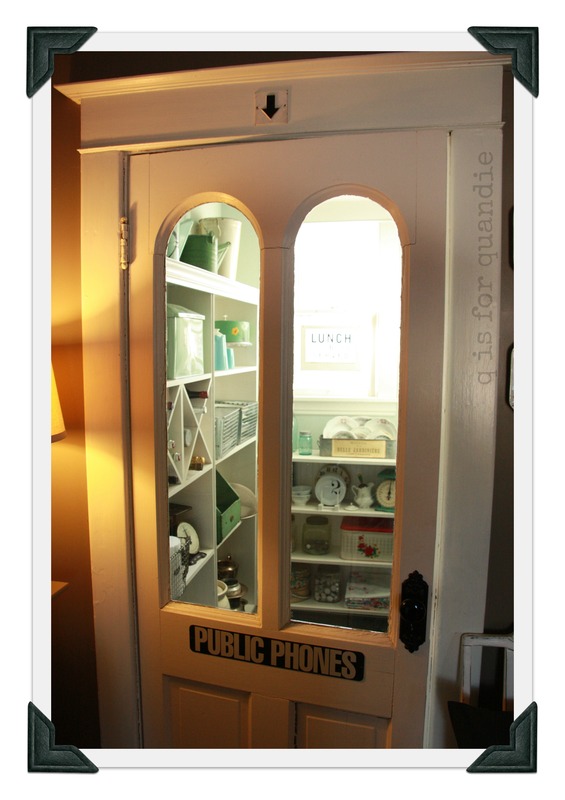 But by the way, the pantry is beautiful no matter what! I’m very jealous of the door and of you having Ken! Well, we are really tall, so that helps … lol … actually we can reach the sections of shelves closest to the door by standing on the first step or two, but of course as the steps go down, we can reach less and less. That’s why I just have decorative stuff on the upper shelves on that end. I can’t reach that stuff at all. Okay, I feel better! It is very pretty. I also found you from Better After. Here from Better After… very cute!! love the shelving! we have the same issue with a creepy basement in our 1829 farmhouse. we ended up putting a hatch door over our stairs so we can walk into our pantry. we have a hook on the wall so when we need to go down, the hatch door stays safely up.